Do toi think that Lacie is beautiful? Which Nightray is your favorite? Out of my haut, retour au début ten, who is your favorite? In Pandora hearts odds and ends . There is this girl . Who is she ? The one has the ponytail. What do toi think about chapter 91? Where can i read the manga? This year's November issue of Square Enix's Gangan Joker magazine will announce the titre and topics for a new manga par Pandora Hearts creator Jun Mochizuki on Thursday. The series will be titled Vanitas no Carte (Memoir of Vanitas) and will combine "19th century Paris," "vampires," and "steampunk." The series will begin in Gangan Joker's January 2016 issue, which ships on December 22. Gangan Joker announced in June that Mochizuki would launch a new series. Japanese Lyrics: Bokura wa mirai wo kaeru chickara wo. Yume ni mite te ta. warratte ita boku no yowasa wo abaita. Bokura wa mirai e makua yuuki wo. The power to change the future. We have seen in our dreams. 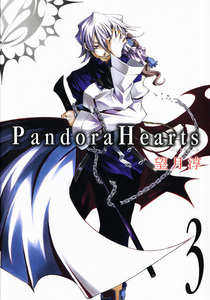 Hello Pandora Hearts fans, Do toi want another season of Pandora Hearts? Then please sign the petition to bring on another season! even If toi don't want another season It would mean the world to me if toi guys did. right no only about 3,500 people signed the petition since there are 2,021 of toi guys toi could really bring the numbers up! Please Bring the Pandora Hearts fans another season of Pandora Hearts. Please bring me my favori anime. also lacie was cast par the abyss but why leo hasn't not! is that because he is the suivant glen? Deluxe animé cosplay costumes for sale. Custom made in your own measurements. Free and fast shipping available. I'm gonna cry, Pandora Hearts is so amazing and unique. Guys this is officially the end :o Pandora Hearts is going to end this month. I'm gonna miss it so much T T T For five years I've been lire this epic manga and I just l’amour it so much!! a comment was made to the poll: Who's your favori Baskerville? a comment was made to the poll: 1. Wich Baskerville? a comment was made to the poll: Best girl? a comment was made to the poll: My three favori characters; who do toi like the most? a comment was made to the poll: do toi think alice and oz are going to end up in love? who took break left eye?